Furia is the world’s best performing solar boat. Since 2010 it has finished first in just about any international solar boat event, be it in tiny waters or on open sea. Built by MG. Powered by MG. Driven by MG.
Our ambition was to win each and every leg and we dit. It has been a tough week, because the boat was damaged by rubbish in the water and we had to work day and night to finish all repairs in time. But we did, so this is amazing! It all started when long time friends and study mates Gerard van der Schaar and Mark Scholten decided to build a boat and participate in a Dutch solar challenge. Since 2009 their Furia solar boat has finished first in just about any international solar boat event, be it in tiny waters or on open sea. 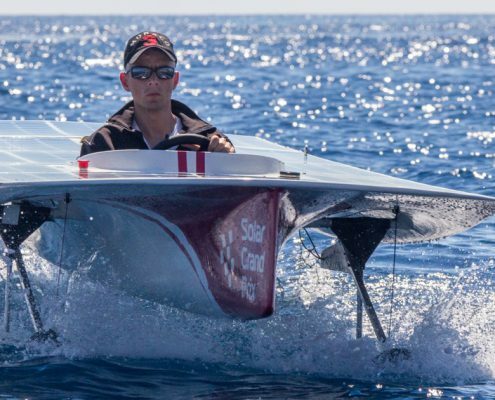 The CLAFIS Private Energy solar boat team has been working hard and during race season even around the clock, to push boundaries and break records. Every tiny detail is optimized to improve performance, resulting in a state-of-the-art solar boat, with all components working seamlessly together. After a change in sponsorship the CLAFIS Victron Energy solar boat team continues to compete in solar races, eager to go to extremes in order to defend their title. 1/8 mile with an average speed of 24 knots (44 km/h).